Imagine having no place to live, because the country you call home wants you dead? Imagine having to always be on the run, never knowing who you can trust? And, imagine that all this is happening even though you have done nothing wrong, beyond the desire to live and be with your family? It was an odd feeling to walk the streets of a country knowing that not a single person knew your name or a thing about you – or would notice if you lived or died. Keita has always dreamed of running in the Olympics, but instead he is running for his life. He is living in Freedom State as an Illegal. He needs to find a way to stay hidden long enough to make some money to save what is left of his family. The only way he can think to do that is by winning some races, which unfortunately puts him in the public eye. Even though he is doing his best to keep a low profile, he can’t help but make some acquaintances along the way, some of whom prove to be on his side, and some not so much. 1. The running. I’m not a runner myself, but I still loved to hear about Keita’s running as a boy, and the importance placed on running in his country. The races were fun to read about, and, since he was literally running to save his life, they were also suspenseful. I was cheering for him the whole way. 2. The characters. There are a lot more characters in this book than I was expecting. At first I wasn’t sure what to think of it (as some were more 3-dimensional than others), but soon enough I was enjoying getting a view of the story, and a few smaller connected subplots, from several different perspectives. We got to follow around a reporter, a police officer, the owner of a Bawdy house, a girl working at that Bawdy house, a boy working on a documentary, a sports agent, and a handful of Government officials. 3. Ivernia. Ivernia was the best. Who says old women can’t make a difference? I love, love that she gave out library cards to anyone who wanted them, even if they were without proper documentation. Those patrons were so grateful. 4. Lawrence Hill kept it light. Based on my only other experience with Hill (The Book of Negroes), and the subject matter, I was half expecting this book to be a real downer (which also would have been fine with me). But not everyone wants to read heavy, depressing books. Hill’s decision to keep this one light makes it appealing to a wider audience. 5. The relevance of Keita’s story in our world right now. The Book of Negroes is an historical novel, telling the story of Aminata’s journey to slavery and back out of it again. I loved it for helping me to imagine something unimaginable in history, as well as to understand the repercussions that are still going on. Keita’s story is happening right now – in time to do something about it. 1. To write this story, Hill made up the two countries involved, Zantoroland and Freedom State. I can understand why he did it, and it might not bother other readers at all, but the fact that they were made up made the book seem less serious, or less real (to me). I had to keep reminding myself that this is happening to real people in real countries. Making his countries up, though, did allow him to create them the way he wanted. He was able to work them into the story he wanted to tell. 2. The end of the story might have come together too nicely/conveniently for some readers, even though this reader was okay with it. I think it’s good to give us some hope, keeping in mind that there are so many stories in the real world without any. Now I wonder what Lawrence Hill is going to tackle next? In the meantime, I still have some of his previous books on my to-read list. I’m especially interested in reading Any Known Blood and Black Berry, Sweet Juice. I hadn’t heard of this book before your review. Now I have to read it. I watched The Book of Negroes when they made it a television mini series– it was fantastic. The Book of Negroes *is* fantastic. I was nervous about how well this one would hold up in comparison. They are very different books, though – different styles, different topics. So, as long as you’re not expecting the same type of book, you should like The Illegal, as well. I haven’t watched the mini-series yet – good to know you liked it! You mention that this is a story that is happening in the world right now… does the author have any particular countries in mind? Or is that something the reader infers? If the author has particular countries in mind, he doesn’t mention them. The countries/issues in the book are just meant to represent real-world problems wherever they may be occurring. I still need to read this. I have to admit, I’m kind of disappointed that he made up the countries. You have to read Any Known Blood. It’s amazing – I loved it so much. After you read it, let me know what you think about the made up countries. I can see why he did it (maybe no one country had all the elements he was looking for in his story), but it did make me feel like all of it was just made up. Any Known Blood – yes! The Book of Negroes mini-series is so good! I bought The Illegal for my mother and I’m keen to borrow it as soon as she’s finished reading it. I’ve wondered about the invented countries, so it’s interesting to hear your response. The focus on running to save your life makes the book sound irresistible to me. Can’t wait to read it. Oh it would! And, I think the lead character couldn’t really be anything but a runner – it just wouldn’t be the same. I hope you both like it! The Book of Negroes was already on my TBR list. Now Any Known Blood has been added. I don’t know about this one… Glad you liked it! This one reminds me of “The 39 Steps” for some reason. I haven’t read The 39 Steps, so I can’t help you there. Which 39 Steps are you referring to (when I looked it up, there were several to choose from)? The 1915 novel by James Buchan which Hitchcock based his movie on. The fake countries threw me off too and I didn’t understand why the book was set in 2018. I was hoping to find this out in one of Lawrence Hill’s interviews, but haven’t found anything yet. Otherwise, I thought this book was excellent. The only thing I can think of is that he didn’t want to be accused of picking on any one country, or getting something wrong if he chose real countries to use in his novel. ?? Did it come off too fantasy or sci-fi to you? Or perhaps it is. 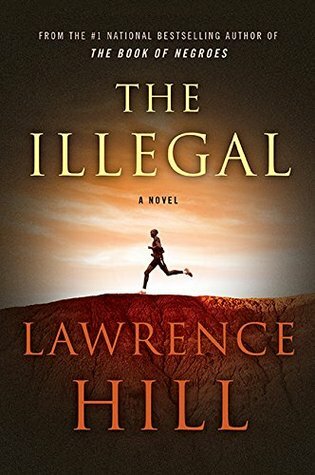 I just missed Hill at our book festival here but still am curious to read The Illegal. Is it suspenseful??? No, not sci-fi or fantasy. Fast-paced literary fiction is the best way I can describe it right now (you know, until I shut down the computer and the perfect description pops into my head). It is suspenseful in parts. You should definitely read it! I’m definitely someone who likes my stories to come together nicely 🙂 I like when all the elements in a story are used and connected at the end and typically prefer happy endings, although there are some sad books that have really won me over too. I’ve never heard of this author–thank you for the heads up, Naomi! He is best known for ‘The Book of Negroes’ – so good! I think in the US it is known as ‘Someone Knows My Name’. I love the sound of Ivernia’s character. I’m looking forward to this one, but I am hoping to read some of his backlist first (particularly the ones you’ve already mentioned)! I am so looking forward to the day that I finally get to one of his other books!